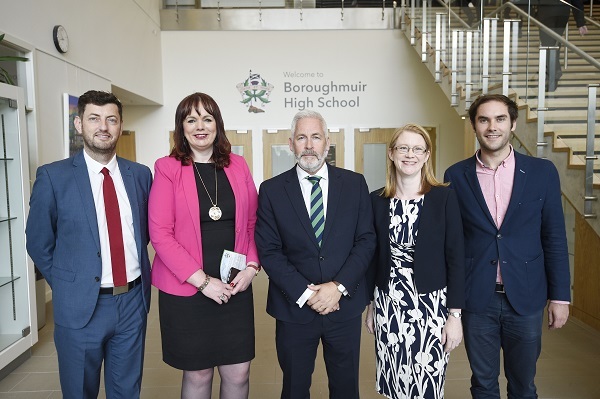 The new Boroughmuir High School was officially opened at a special ceremony by the Minister for Higher and Further Education and Science Shirley-Anne Somerville today (Wednesday 13 June). She was joined by Councillor Adam McVey, Leader of the City of Edinburgh Council, Deputy Leader Councillor Cammy Day, Education Vice Convener Councillor Alison Dickie and Head Teacher David Dempster. The new school opened its doors to pupils in February this year and features a wide range of enhanced facilities for pupils and staff. In addition to the extra classrooms and science laboratories there are improved social spaces for pupils plus new catering facilities. Sports provision has increased from two small PE halls to five new areas including the first rooftop multi use games area (MUGA) in the country, a fitness suite and dance studio. The new high school, which won Building of the Year in the Edinburgh Architectural Association Awards 2018, has received Scottish Government funding through the Schools for the Future programme. It was designed by Allan Murray Architects Ltd and built by O’Hare & McGovern. 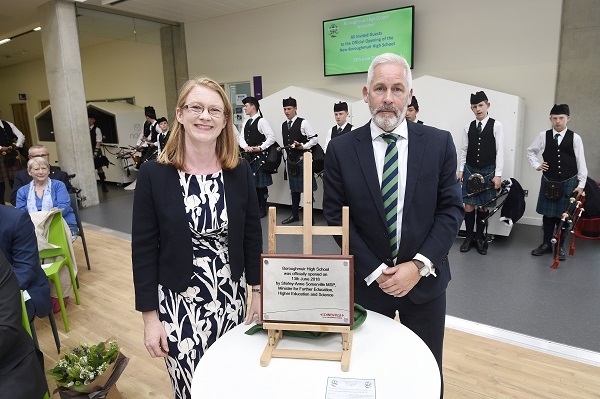 Council Leader Adam McVey said: “This is the third new high school we have opened in as many years and demonstrates the Council’s commitment to investing in our children’s education with support from the Scottish Government’s Schools for the Future programme. “There have been challenges along the way and I would like to thank the school staff, pupils and parents for their patience – I am sure everyone will agree the school has been well worth the wait. Deputy Leader Cllr Cammy Day said: “As a former Education Convener I am proud of our innovative school design strategy that puts our pupils at the heart of the process. By engaging with our teachers and pupils from the start we have been able to create an educational brief and vision for this school that truly delivers a unique building that meets the needs of all its pupils. “Walking round the school today it is clear the building is having a positive impact on teaching and learning and allows the school to make the best use of new technology to equip them for their future careers. Minister for Further and Higher Education, Shirley-Anne Somerville, said: “In the last ten years this Government has massively improved the school estate right across Scotland. Since 2007, 751 school building projects have been completed and we have invested £1.8 billion as part of the Schools for the Future programme. Our infrastructure investment has ensured that teachers are able to teach their pupils in dynamic, high tech facilities, which is vital if we are to meet the future learning needs of our young people. Head Teacher David Dempster said: “This is a truly historic and exciting day for the school and one that all our staff and pupils wanted to be part of. 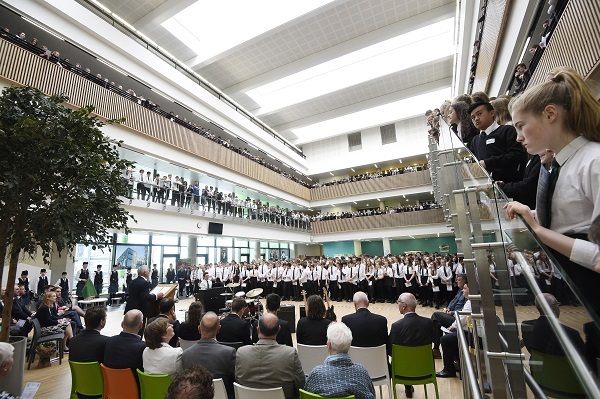 “Having this incredible new building, which is of course now Edinburgh’s Building of the Year, with its central atrium space that can accommodate over 1200 people in the same place at the same time gave us the opportunity to have everyone part of the ceremony which has made this one of the most inclusive school opening ceremonies ever!